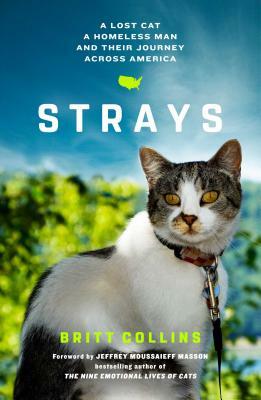 For fans of A Street Cat Named Bob and Dewey: The Small-Town Library Cat Who Touched the World, Strays is a compelling true story of a man who rescues a stray, injured cat and how they save each other. Homeless, alcoholic, and depressed, Michael King lives in a UPS loading bay on the wrong side of the tracks in Portland, Oregon. One rainy night, he stumbles upon a hurt, starving, scruffy cat and takes her in. Nursing her back to health, he names her Tabor and she becomes a bit of a celebrity in southeast Portland. When winter comes, they travel from Oregon to the beaches of California to the high plains of Montana, surviving blizzards and bears, angry steers and rainstorms. Along the way, people are drawn to the spirited, beautiful cat and moved to help Michael, who cuts a striking figure with Tabor riding high on his backpack or walking on a leash. Tabor comforts Michael when he’s down, giving Michael someone to love and care for, and inspiring him to get sober and to come to terms with his past family traumas and grief over the death of his life partner. As they make their way across the West Coast, the pair become inseparable, healing the scars of each other’s troubled pasts. But when Michael takes Tabor to a veterinarian in Montana, he discovers that Tabor has an identification chip and an owner in Portland who has never given up hope of finding his beloved cat, Michael makes the difficult choice to return to Portland and reunite Tabor with her owner. Now Michael must create a new purpose in his life after Tabor. The authentic tale of an adventurous and charismatic cat and her compassionate human admirers, Strays proves the healing power of love and the profound bond between humans and animals. Britt Collins is an English journalist who writes for the Guardian, the Sunday Times, the Independent, Harper’s Bazaar, Condé Nast Traveller, and Billionaire.com. She has volunteered at animal sanctuaries around the world, from tending big cats and baboons in Namibia to wild horses in Nevada—a labor of love that has inspired features for the Guardian and the Sunday Times. While writing Sunday People, she has raised hundreds of thousands of dollars for many international charities through her investigative animal-cruelty stories; as an activist, she has helped shut down controversial breeders of laboratory animals. She lives with her cats in London. "Readers who empathized with the honesty and humility of James Bowen’s A STREET CAT NAMED BOB will be moved by this healing love story." "Britt Collins's accessible and empathetic new book, Strays, portrays the close bond between Michael and Tabor as they traveled through America, facing the challenges of living on the road, both from nature and from circumstance. The story continues to linger in my mind and reminds me that the care of an animal really can motivate and make change possible." “Strays is the affectionate telling of a remarkable story. There is much more here than the healing power of the human/animal bond or a tale of survival and adventure on the margins of society. Strays reminds us that there is no such thing as a small or insignificant life and that every life has intrinsic value." "Strays is a window into another world, and gives a compassionate and honest account of what it feels like not to have a place to call 'home', and to seek comfort in unexpected places. And any cat lover will fall head over heels for little Tabor!" "No doubt Strays will be seen as a cat book, but make no mistake, this is a book about humans, and how animals, especially cats, can reach a paw into our hearts and pull out the best of us. Part love story, part adventure epic, part travelogue, part social commentary, Strays will give you insight into the kindnesses of strangers, the healing capacity of our furry friends, and the resilience of both man and cat in the face of blizzards, long nights on sidewalks, wild beasts, and dark memories. On top of that, Strays is a galloping read that you won’t put down." "A powerful tale of a drifter saving, and being saved by, a stray feline. This book is a reminder that the animals that shadow us in our lives help to make us more human."